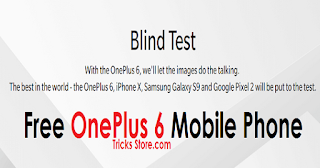 OnePlus 6 Mobile Offer, Oneplus Free Gifts, Oneplus 6 Offer Trick, OnePlus Stock Photo Blind Test Contest – How are you all, here we are with OnePlus stock photo blind test free oneplus 6 mobile contest. where you can win Free OnePlus 6, T-Shirts, Backpacks, Bags and much more by just choosing the best photos given to you. And to make your chance to win you can also refer this to your friends & family. 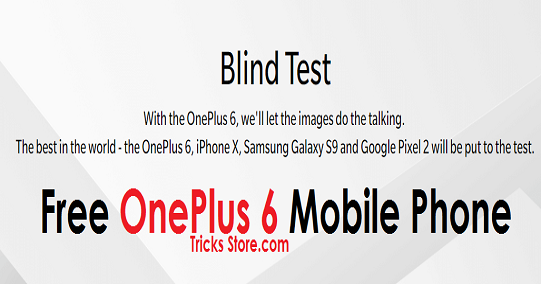 When you will enter in this Oneplus contest you can see 4 Photos putted by OnePlus 6, iPhone X, Samsung Galaxy S9 and Google Pixel 2 & You have to Choose the Best one from all those 4 Phones. That’s it you have to do this to win real Oneplus 6 mobile Phone. Offer is as simple as you have to choose best photo on your mobile phone, you have to click (vote) on best photo and make your cahnce to win free oneplus mobile. 2. After that just scroll down and you will see ” Vote Now ” option, just click on it. 3. Then make sign up using your Facebook or Google + account. 4. Now after sign up you will see 4 Photo options ( Architecture, Low Light, Potrate etc). 5. Now you have to vote for all the 4 sections one by one. That’s it you’re done, Now follow below given steps and enjoy more lucky draw via refer & earn. 1. Just go to main page and scroll down. 2. Their you can see ”Invite and win the OnePlus 6 ” section there. 3. Now just scroll down & copy your referral link & start sharing with your friends and for each successful refer you get 1 lucky draw chance. * Offer Starting 11th May until 14th May 2018. * The top 3 users on our leader board will take new OnePlus 6. * The top 3 users from our leaderboard can redeem their vouchers against select variants of the OnePlus 6 from oneplus.in, once sales commence. * The contest will be closely monitored & if any found cheating will immediately forfeit any points / rewards accumulated. * In the event of a tie between more than two users for 3rd place, the prize will be forfeited.